Discussion in 'Education and Employment' started by Kallevala, Feb 23, 2018. Hello everyone! My name is Kalle, and I am investigating the experiences of individuals on the autism spectrum who are employed, or are seeking employment now or in the future. This project is part of my Bachelor studies and we are interested in the views and experiences of individuals with autism, their families, researchers or service providers supporting individuals with autism, as well current employers and potential future employers of individuals with autism. Individuals on the autism spectrum are often underemployed and face unique challenges when entering the workforce. It is therefore crucial to understand the conditions of the current working environment. This will enable us to support individuals with autism to have equal opportunity to access employment and facilitate their well-being and independence. 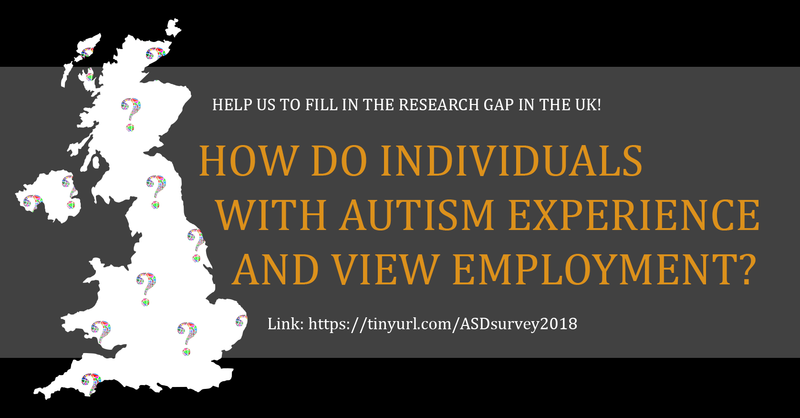 The survey should take about 15 minutes and explores themes around employment and support services for individuals with autism. This survey is part of an international study, and we hope to understand and describe these themes as they relate to the United Kingdom. We would greatly appreciate if you shared this survey with anyone who might be interested. Our aim is to finalize data collection by March and present this data at an international meeting of autism researchers and policy makers in May. Please do not hesitate to contact me or my supervisor, Dr. Chiara Horlin, if you have any questions. Disclaimer: I am not sure if this is considered as advertisement and thus breaking the forum rules. If so, please feel free to delete this. Interesting study, I would like to participate. However, the consent form states that by agreeing, I consent to being audio recorded. What’s that all about? And second question: it’s not entirely clear to me whether this study is also open to people outside of the UK. Can you elaborate? I'm in Canada and would like to participate as well. This is something I have interest in. Here in my area I did something similar before Christmas and it was met rather positively. Hi Bolletje! Thank you for your interest! There is no audio record in the online survey. That part is, however, still in the consent so that all participants of this study have the same standard consent. The audio part is included in the consent to make sure that, if participants are unable to type the answer, they can wish to contact me for a recording session of the answer. And yes, this study is specifically only for UK population. @Kallevala Thank you for your quick response (dig the username, by the way!). I’m not UK-based, so unfortunately I won’t be able to help out. Best of luck!